Tortellini, cappelletti, whatever you want to call them, mushroom tortellini are little packets of love are one of the finest expressions of care and calm that I know of. If your mind is in the wrong place, making tortellini at home can be tedious, infuriating. Maddening. If you are an impatient person, if you like to text while driving, multi-task from dawn to dusk, “bang things out,” don’t make this pasta. Making tortellini requires a sense of peace, zen or mental calmness that doesn’t necessarily require a quiet room… but it helps. Why? Even if you make them for just your family, you’re talking about 150+ tortellini here. That is a lot of precise, repetitive movement with delicate, small pieces of pasta dough. If you’ve never made tortellini before, start with their larger cousins, tortelli. They are typically twice the size of the tortellini you see in the picture above. Easier for beginners. Real tortellini are tiny. I am not a big man, but I am normal-sized, which makes me almost too big to make this little pasta. The deft finger movements needed to make tortellini require a degree of manual dexterity probably best suited to piano players and small girls. But I get by, and did manage to make almost 200 morel tortellini the other day as a treat for Holly. And treat they are. I can whip out a meal’s worth of cavatelli or tagliatelle in minutes. Not so with tortellini. They are a labor of love, a present to someone you’re very fond of — or at least someone you want to impress. I am pretty good at making them, and I know a trick to save a full hour’s worth of time when making the dough, and it still took me a solid 2 hours to make two meals’ worth. So do this on a weekend, or a day off. If it makes you feel better, you can freeze your tortellini and they’ll keep for a couple months so you can eat them at a moment’s notice later. Tortellini dough is typically pretty simple, just water and flour and eggs. The real magic is in the filling. I am sure Tuscans and whichever other variety of Italian that makes tortellini have very set ideas on what should and should not be inside a tortellino, but I am an American, which means I can put whatever I want to inside. In this case, mushrooms and ricotta. This rendition of mushroom tortellini is, albeit time-consuming, pretty straightforward. I did make my own ricotta cheese, using this recipe, but only because I felt like it. Store-bought, whole milk ricotta would be perfectly fine. You could also fill your tortellini with finely ground meat, pate or a seafood mousse, ricotta and some sort of green herb or vegetable, mascarpone and nuts, a really thick pesto… you get the point. 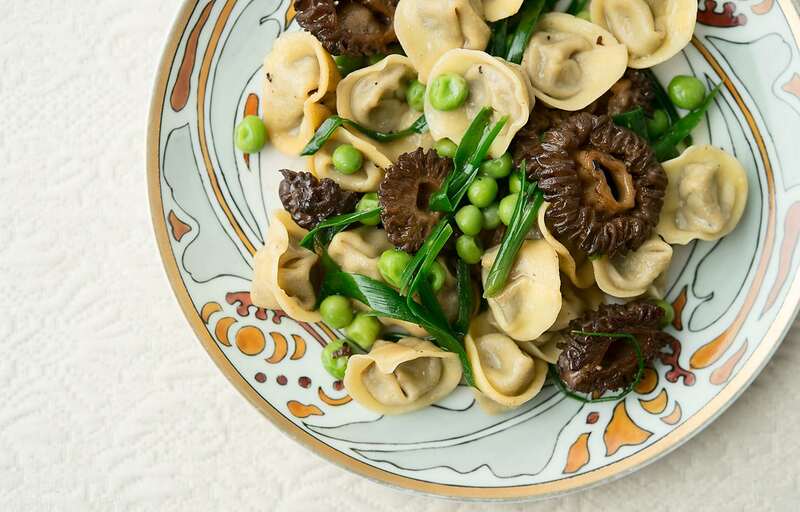 When you serve your mushroom tortellini, go simple. A lot of times I’ll just do broth, or herb butter, or olive oil and black pepper, maybe a splash of lemon juice. In this case I used a bunch of springtime ingredients, cooked very simply and tossed with the pasta. And yeah, I had to add some more morels to the mix, for some hot morel-on-morel action. Can you blame me? 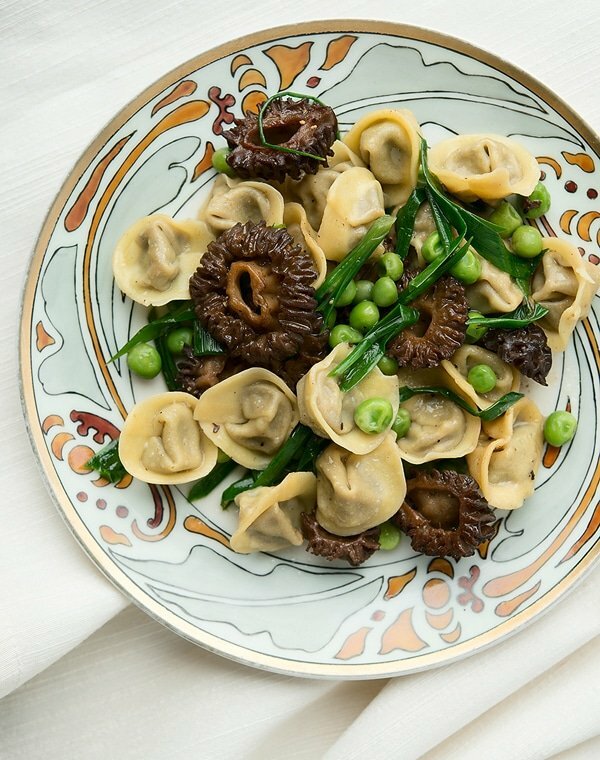 While I like this recipe with morels or porcini, you could use any wild or cultivated mushroom for these tortellini. Use the same mushroom for the final dish that you use in the pasta filling. If you want to split up the work, make the tortellini one day and then freeze them. Once the pasta is made, this dish comes together very quickly. If you do freeze your tortellini, do so on a baking sheet. Only when they are fully frozen should you transfer them to a freezer bag. Once made, they will keep, frozen, for about 2 months before deteriorating. Submerge the dried morels in 2 cups of warm water and set aside. To make the pasta dough, lightly beat the eggs and water together. Put the flour in a large bowl and make a well in the center. Add the beaten eggs and, using one finger, incorporate the flour and the eggs. When you have a shaggy mass, start kneading the dough, either in the bowl or on a clean work surface. Knead for 5 to 8 minutes. Wrap the dough in plastic wrap and set aside for at least an hour, or in the fridge up to overnight. TIP: If you have a vacuum sealer, seal the dough in a bag. It will instantly hydrate the dough and you need not wait the hour. To make the filling, gently lift the morels out of the soaking water and squeeze them dry. Chop finely. Set them in a large saute pan and turn the heat to high. When the morels start sizzling, add the butter. Toss to combine and saute until the morels begin to brown. Add the garlic, caraway seeds, salt, pepper and thyme. Cook another minute. Turn off the heat and let everything cool. While you are waiting, strain the morel soaking water through a paper towel and then boil it down until it's about 1/2 cup. Save it for later. When the mushroom mixture has cooled to room temperature, put it into a food processor or blender with the ricotta and buzz it to combine. You want the filling to be pretty smooth because you will be using it by the half-teaspoon -- large chunks will tear the pasta. Put the filling into a plastic freezer bag and shove it to one corner. Snip off the corner of the bag so you can squeeze out a little filling at a time -- if you have a piping bag, use that. Cut your pasta dough into 6 equal pieces. Keep all of them covered in the plastic wrap until you need them. Roll out one piece very thin -- I use the second-to-thinnest setting on my Atlas pasta maker. Lay the pasta sheet on a clean work surface (I use a maple board) and use something to cut out squares or circles. I use a round pastry cutter about 1 1/2 inches to 2 inches wide. You want your tortellini to be small, so use something no larger than 2 inches across. Squeeze a little filling into the center of the circle or square. How much? You'll get the hang of it soon enough, but remember that you will need about 1/4 inch all the way around the filling for the tortellino to seal correctly. It's better to have to little filling than too much. Fold the pasta over itself to make a tiny half moon. Seal the edges. You might need to dip your finger into a little water to do this if your pasta has dried out too much. (You can stop here if you want, and while they will not be tortellini, they will still be tasty.) Now fold the half moon over on itself and seal the ends of the half moon. You now have a tortellino. Now make 149 more -- seriously -- as this recipe is enough to make 150 tortellini. It takes time, but you get into a zen state soon enough. Set each finished tortellino on a baking sheet that's been dusted with semolina flour or cornmeal. Don't pile them up on each other, or they will stick and become a glob. 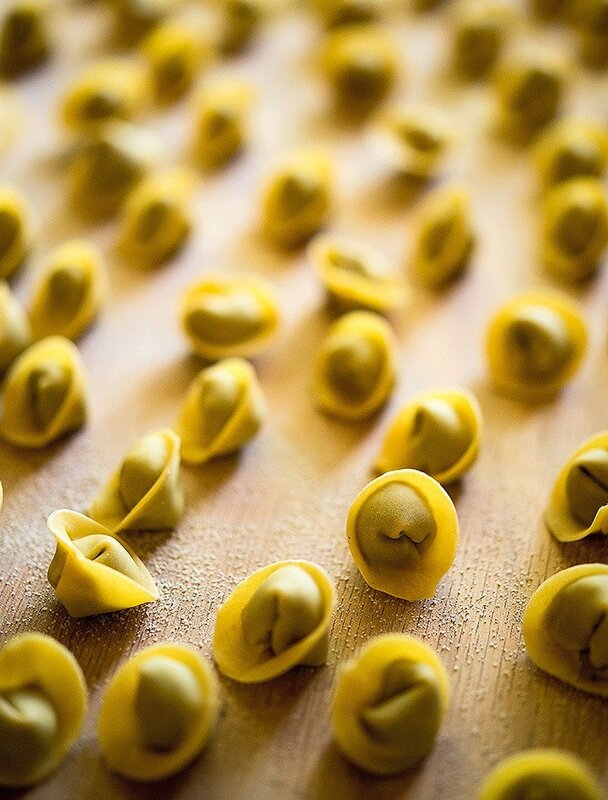 When your tortellini are done, you will need to cook them that day or freeze them. Filled pasta does not do well in the fridge for more than a few hours. They can sit out a couple hours, though. To finish the dish, boil some water and then salt it well. Take a saute pan and set it over high heat. Add the fresh morels and wild onion bulbs and let them sear until the morels give up their water. Add 3 tablespoons of butter and saute until the morels and onions begin to brown. Salt them while they are cooking. Add the peas and the morel soaking water and bring to a boil. Turn off the heat and stir in the green parts of the wild onions. Grind some black pepper over everything. Boil the tortellini for 2 to 3 minutes, or 30 seconds after they float to the surface. Add the to the saute pan, toss to combine and serve at once. 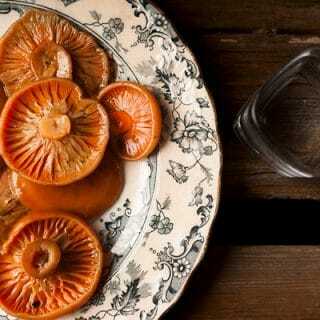 You can find all sorts of recipes for all sorts of mushrooms here on Hunter Angler Gardener Cook! PS. the pasta looks killer!